Say you’ve got two internet connections, and you want to use one for League and the other to stream to Twitch. This could mean that you’re tethered to your phone, or you have ADSL and Cable. You can do this pretty easily with static routes. You want to specify one particular destination should use the alternate connection using the ‘route’ command on Windows. 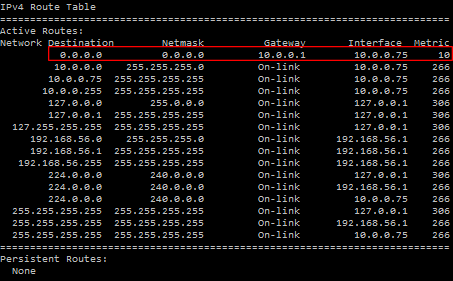 The line with Destination of 0.0.0.0 Netmask 0.0.0.0 is your current default gateway – this is where ALL traffic will be sent, unless an override rule (called a static route) is put in. What we want to do is specify a default gateway for all traffic, then put in an override for LoL, or Twitch, or whatever. Please remember the Gateway IP is important as these are relative to YOUR home connection. It might be 10.0.0.1, it might be 172.20.10.1, who knows. Please use caution when attempting to do this! These IPs are correct as of May 9th, 2016. You can look up these addresses for yourself for whatever program you want to use, being aware they may change in the future.